Yadkinville, N.C. (October 31, 2014) – North Carolina–based themal underwear manufacturer, Indera Mills Co., annouced today the latest expansion to the company’s growing product line with the addition of the womens Merino wool blend crew and pant. For over 100 years Indera Mills has innovated and created quality products to keep women warm. 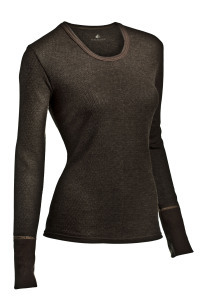 The addition of a Merino wool item rounds out the ladies line. With modern styling and contrasting threads, this piece will be your go-to base layer. The blended Merino wool layer delivers warmth to customers in a single layer garment, all while offering elongated cuffs with flat-seaming details, and a modern, low rise bottom. Offered only to women, the blended Merino wool style will be available for Fall 2015 shipments. This garment is a medium weight, raschel knit for low to medium activity and rated for cold to very cold temperatures. Best used for sitting by a campfire, going to outdoor sporting events, or simply spending a rainy day on the couch with a good book, this piece is the epitomy of versitility and comfort. Available in women’s Moss green with taupe contrast stitching, sizes S-2XL. Crew top and pant sold separately. MSRP: $19.99. For more information please contact Christian Turner at 610.682.2700 or call Indera Mills at 800.334.8605 x200 or visit www.InderaMills.com.